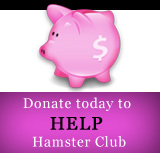 This is the story of how we ended up with 14 hamsters in our house. In March 2012, my partner and I decided we wanted to have a hamster because we loved small pets but didn't have any due to college and roommates. 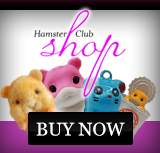 I had owned hamsters for pretty much my whole life, but in that moment, I was hamster-less. We had our own little rental house now with a nice basement, so we decided to get a roborovski hamster. Initially we just wanted one, but a little bit of research suggested robos are happier in pairs, so we decided to get two. But once we got to the pet store, the tank had three siblings, and we didn't want to leave one, so we brought home all three. Bubbles, Blossom and Buttercup. 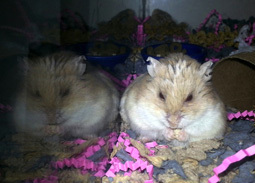 A couple of months later, in June, I went to our local humane society, and it just so happened that there were three older hamsters there looking for homes. One Syrian and two Russian Dwarves. We ended up with all three -- Pipsqueak, Twinkletoes, and Bisquick -- and one, Twinkletoes is still with us. (She might be over three years old now). On September 8, 2012 our little Pipsqueak passed away in our hands. We were devastated. We knew she was old, and she had been to the vet 4 times in the short 4 months we had her with various issues, but we still weren't prepared to lose her. We felt a Syrian-shaped hole in our hearts and sought to get one from a nice breeder at a local exotics fair the next month. We went and found our next little one, a black syrian named Zuki, but the table over had the cutest little Russian Dwarves with speckly dots that they were selling as feeders! So we also "rescued" Speck while there. Speck came home with us and became Bisquick's cage mate. We moved Bisquick out of the split aquarium she shared with Twinkletoes and into an aquarium with Speck. Unfortunately, at that point Twinkletoes's health seemed to be failing due to a lack of companion, so we went to "rescue" another speckly feeder named Toffee in December. But Toffee surprised us with being a boy, so Twinkletoes got a neighbor instead of a roommate. Luckily, Twinkletoes and Toffee both seem happy with that arrangement, and enjoy licking their dividing wall. Then in April 2013 a rescue agency near us, the Exotic Animal Rescue & Pet Sanctuary (EARPS) took in many rescues from a pet store that was closed down. We wanted to help out so we applied to be foster parents. 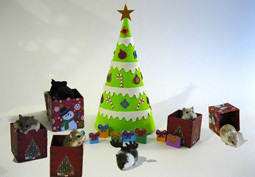 Four syrian hamsters were placed with us, Baloo, Tabitha, Buzz, and Kronk. We were classic foster fails though and shortly after making the rookie mistake of naming them and customizing their cages we adopted all four. Tragedy struck again, on May 1, 2013, Bisquick died in my hands from a combination of age and illness that despite our best efforts we could not successfully defeat. Although we were sad to lose Bisquick we did want to find Speck a friend to live in the other half of a split aquarium. 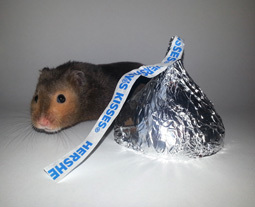 So we started looking for a hamster we knew Bisquick would approve of. We found a hamster in a rescue in my hometown and when we went back for a visit, we arranged to meet Elvis Parsley a Winter White with a cleft lip/palate named Elvis for his permanent sneer. We gave him a forever home and after consulting with an incredibly experienced and skilled exotic veterinarian we found out it was actually a neurological problem probably caused by head trauma as a baby. In late June we found our next hamster. I stopped by the humane society on the way home from work, and there was a Russian Dwarf mislabelled as a Syrian. This little dwarf had shredded ears, cuts on her face, and was very skinny. I asked about her story and it turns out she had been found abandoned in an apartment with two dogs, three other hamsters, and two guinea pigs. Unfortunately only the dogs and our little hamster survived. We brought her home, named her Ruby, and took her to our local vet. At the vet, she received a thorough examination and unfortunately we discovered a tumor on her chest. We scheduled an appointment with our experienced exotic vet and took her up there planning to get her surgery if the vet felt it was warranted. Ruby had surgery and recovered wonderfully. When she came to us she weighed a mere 37 grams and she currently weighs a healthy 54 grams. Finally, our friendly local rescue agency asked us to foster a Syrian with chronic crusty/goopy eye. Of course, we said yes, and named him Mad-eye Moody. Although his eye condition is chronic so he will require special care throughout his life he has been placed up for adoption, but until he finds his forever home he is welcome to stay with us indefinitely. That's how we ended up with 14 hamsters (6 Syrians, 5 R.Dwarfs, and 3 Robos) in our house, and we just love them all to pieces. It's been a busy year. (PS - there are also 3 chinchillas, and an injured deer mouse who will hopefully heal enough to be released soon).